Be sure to click through the photos because I don’t think you’ll want to miss the close ups. Enjoy! This entry was posted in Busan, Photography, Summer and tagged ajoshi, best beach in Korea, Busan, expat blog, expat in Korea, Haeundae Beach, 해운대 해변, Men of Haeundae Beach, photography, South Korea, travel by Meagan & Dave | HappilyEverExpat.com. Bookmark the permalink. LOL this is hilarious! I wish I got the chance to have a peek at this place. I can’t stand Haeundae beach during the summer months. It’s so packed with tents and umbrellas – I much prefer it in the low season. Last year was the first time that I’d actually made an effort to go to Haeundae during the busy season and I only did so I could take photos. I agree… it’s way too hectic there in the summer for me. I did really enjoy people watching! I never realized so many men congregated on the rocks. What?! Old guys aren’t your thing?? haha… So sorry to disappoint! Maybe this year I’ll go back so I can make a sexier post. These pictures were great! That last one actually made me burst out laughing. Can’t believe how crowded that beach is. 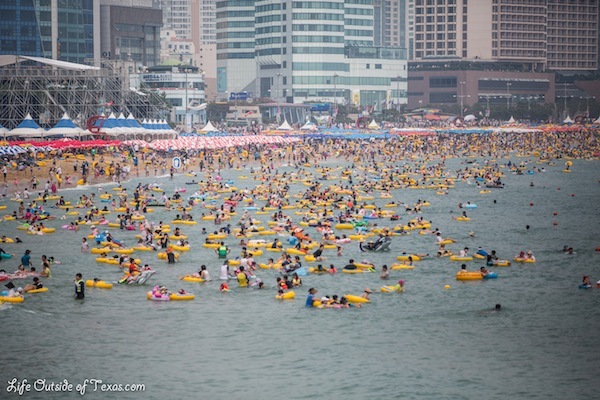 Yongildae (we still call it Bukbu) Beach in Pohang is popular, but nowhere near that crazy. I have had a thing against Pohang since I first came to Korea. At my EPIK orientation they took us on a field trip to.. POSCO. It was the worst field trip ever (we couldn’t really see anything and it took hours to get there) and I got really car sick on the bus ride. I have never been back to Pohang since. Please tell me what I’m missing out on. All I know about is that hand statue sticking out of the water. Wow, what a horrible idea for a field trip! There is a great beach right in the middle of town where we have volleyball and frisbee tournaments in the summer, a number of awesome temples near the city (one inside a dragon that curls up a hill), and one of the best seafood markets in Korea! That hand in the water thing is called Homigot; also awesome to visit, but I wouldn’t get up for a sunrise again! It’s a pretty low-key place compared to Busan, but it’s a great place to live. Hard to tell which men are wearing swim trunks and which have just stripped down to their skivvies. No shame! So un-Korean. Right? I honestly think some of the men were bathing (or going to the bathroom?) because at one point one of the men had his boxers off. I definitely had a moment of misbelief. Nice Job! I like how you let the pictures do the talking. I guess words couldn’t do it justice. But I laughed not in a mocking sort of way, but a… “ah… that’s our grandpa” kind of way. I agree with one comment above that the title was misleading, but in a comedic way. I heard “men” and “beach” and expected beach ready bodies. But I was pleasantly? surprised. Nice post. I was inspired. I’ll try to do more visual posts as well. Thanks for the great comment. It was such a funny day. I made the trip to Haeundae Beach that day specifically to get pictures for my blog, but I thought I was just going to be taking pictures of the crowds of people and umbrellas and it turned into something more. These guys were cracking me up. I could have sat there watching them for hours. It was like a culture of these older men who had decided to spend their days on the rocks. Yeah, I like the older Korean guys. I think they reach an age where they don’t care what other people think, and just rock their own thing. The arm things are a nice touch, too. Funny pictures, thanks again. hahaha this is NOT what I expected, but it was hilarious. Hot bodies! 😛 People on the beach here look so different than back home, I was so shocked the first time I saw someone fully clothed go in the water! I see more and more women every year wearing bikinis though. Can’t wait for summer!! Yeah, the beach experience here is a bit bizarre. 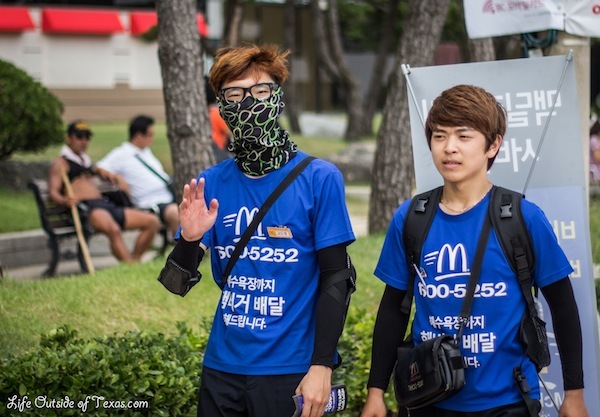 But I always love seeing the super tanned Korean guys in their speedos on Haeundae Beach. Rebels!